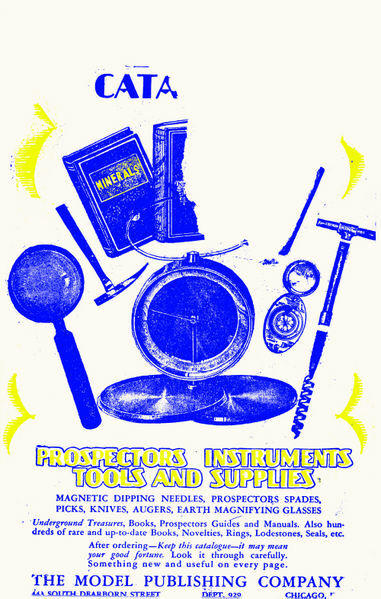 While Model Publishing Company had their bundles, they did include a number of useful tools for the prospector — tools actually identified in the books as things to bring while prospecting. 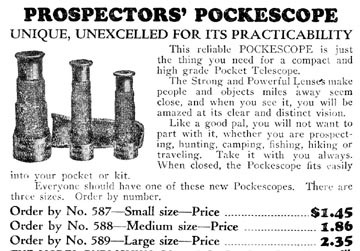 Despite the examination of small objects required for prospecting, distance-viewing has a inordinate emphasis here: a ‘pocketscope’ (a small telescope), a 3-foot telescope, and field glasses. 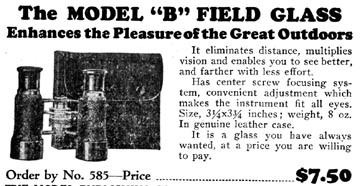 The pocketknife and magnifying glass are about the most useful of any of the tools advertised in the catalog, but as they’re not exactly the most difficult tools to acquire, weren’t prominently featured in the catalog. 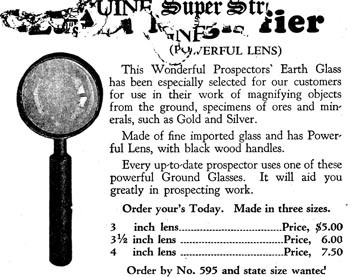 The Wonder Instrument of the Age is numerous things, all wrapped into one: A Prospectors’ Field Glass, Opera Glass, Pocket Compass, Stereoscope Laryngascope, Burning Lens, Pocket Mirror, Reading Glass, and Magnifying Glass, all combined in one instrument. A Stereoscope Laryngascope? 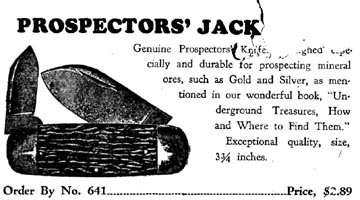 Unless the prospector is moonlighting as a doctor, I can’t imagine why a tool to look down someone’s throat could possibly be a selling point. A master of synonyms will quickly notice that the majority of these myriad of tools are lensed tools — magnifiers of some sort, whether two lenses paired for long distance or a single lens for magnifying small objects. Still, I could see the usefulness of such a compact, functional object, and it shouldn’t surprise anyone that younger relatives of the Wonder Instrument of the Age are still being manufactured today. Model Publishing Company devotes several pages to discount collections of different combinations of the prospecting products they offer. Each kit includes a book, a scientific accessory of some sort, a tool of some sort, and something magnetic. The kit, above, is probably the least useful of the kits, but most telling of the rest of the catalog’s offerings. This lot would be useful if it stopped at the dip needle and book — both would be of use to an amateur prospector — but to include so much magnetic materials with it I can only imagine that, if shipped together, the dip needle would end up severely magnetized in the wrong way. The magnetic rod appears to have some purpose beyond “finding small screws you dropped” and “magnetizing small needles” — it seems far too deliberate in design, and I’d wager its original purpose is dowsing. There’s more convenient ways to use a magnet without designing it into a metal rod with a handle/crook at the top, and advertising its ‘magnetic twin point.’ One of the rod’s selling points is that it is “attracted by all but non-magnetic metals,” which seems like a roundabout way of saying it’s only attracted to magnetic metals, and seems worded to not discourage those interested in finding other hidden subterranean treasures than an iron ore deposit. In a similar vein, but with a far different purpose, is the inclusion of a lodestone and ‘magnetic sand.’ While these objects hold little direct application in finding precious metals underground, many people believed (and still do) that good fortune would come to the owner of such materials. A lodestone, for the superstitious and magical, attracts wealth and success as well as it does an iron nail — the magnetic sand represents those desired aspects of life, and the lodestone the bearer of the good luck charm. As I mentioned, the practice isn’t lost to time — you can still get a lodestone and the cutely-named ‘lodestone food‘ from magical shops. 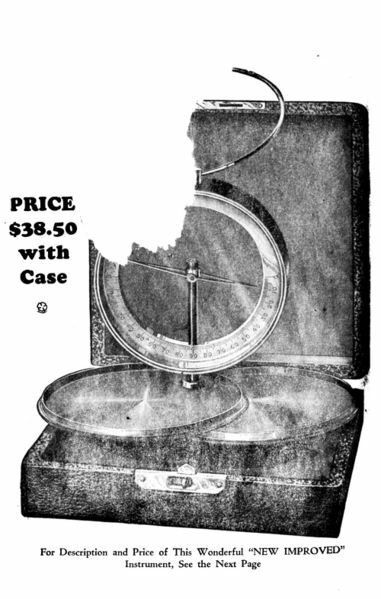 Once we’ve gotten past the dip compasses, the next two pages are the most important (at least according to this catalog) books for any prospector to have. And, thanks to the advances in modern technology, both books have been scanned (one by Microsoft, the other by Google), so if you’ve got a dip needle and a need to find some gold, these books can be had for free. 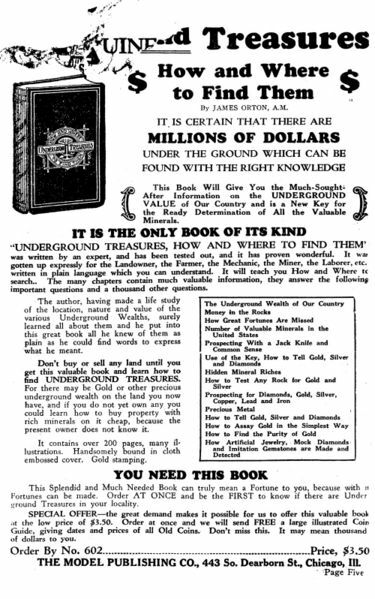 Underground Treasures: How and Where to Find Them, by James Orton, was first published in 1872, towards the tail-end of most of the big US gold rushes, but from that we can only assume Orton had used the time to become an expert in the field. The foreword reads that the book was written for “the landowner, the farmer, the mechanic, the miner, the laborer, even for the most unscientific,” to save them from bad deals or overlooking a wealth of minerals on their own properly. The book is dry and instructional, but full of factual information; I’d warn against using some of its ‘tests’ for precious metals, because they rely on some volatile chemicals and reactions that may not be the healthiest for the amateur to be messing with. The book does diverge from prospecting to describe how to identify genuine cut stones, versus cheap stones or paste, describing the stones eloquently: “A first class ruby has the color of the blood as it spirts from an artery.” Orton was ready to assume that prospectors were well-familiar with that color, which makes me a bit worried about how he gained his education in prospecting. 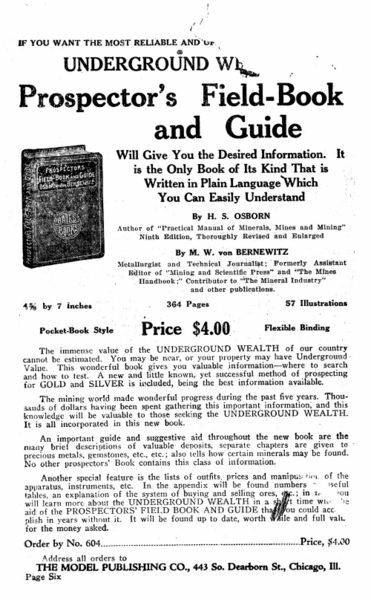 Prospector’s Field-Book and Guide: In the Search for and the Easy Determination of Ores and Other Useful Minerals, by H. S. Orton and M. W. Von Bernewitz, was first published in sometime in the early 1900s (the 8th edition was in 1910). At twice the size of Underground Treasures, Prospector’s Field-Book uses an extra thirty years of science and a thorough explanation of modern knowledge…although it does diverge into some more old-fashioned superstition (admitting it though) of how gold if often found on the right branch of a river, and several pages devoted to the kinds of plants that are tell-tales for buried metals. James Orton cut some of the basic skills from his book, it seems, but this book includes some more detailed instruction on how to use blowpipe and other technical tools. The size of this book makes it less of a ‘field-book’ than Underground Treasures, but probably more useful. Model Publishing Company didn’t actually do any publishing here: even the pictures in the catalog betray that fact. The covers that Model shows in their catalog are the editions linked above — the Prospector’s Field-Book says “Baird Books” across the cover. A publisher doesn’t usually distribute somebody else’s books, but a catalog marketer certainly would, especially if it’s to market remaindered or out-of-print books to make a sale. Model pulled out all the stops, in that refreshingly manipulative hard-sell language that’s disappeared from modern marketing: there’s millions to be found under your feet, be the FIRST to find it, this is the only book of its kind (said about both books), order AT ONCE! Tomorrow, we’ll see just how this fits into Model’s marketing plan. see the next page — although it will tell you what’s so great about this particular dip needle, it doesn’t really say how to use it (although, if you buy it, they will send instructions with). Dip needles are essentially a compass, but mounted sideways; instead of a magnetic source being measured in the north-south-east-west vein, a dip needle indicates just how close to the horizon a magnetic field line is. Standing on top of one, it points down, but most everything else will be some degree of angle from the horizontal. This particular dip needle has an additional axis, a “z” axis to the compass’ x and the dip needle’s y. 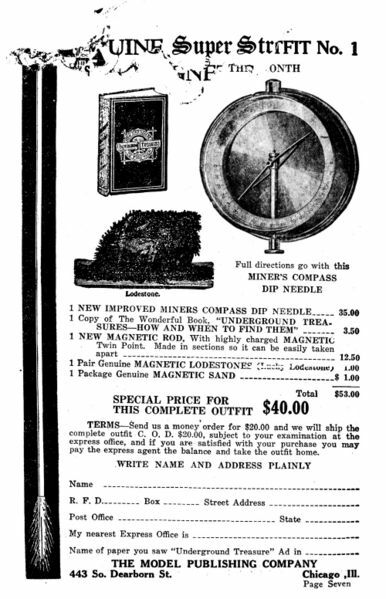 Model also offered a z-less version of the dip needle, for the price-conscious prospector. Given the external amount of magnetic influence on our planet just by having a north pole, a dip needle may seem like a fancy form of dowsing, but they do have a history of genuine use. Today, we use magnetically tuned electronics to find buried metals, but in 1930 these archaic mechanical devices were the state-of-the-art technology for prospectors. Dip needles have shown to be successful in prospecting for magnetic and conductive metals, but for obvious reasons not particularly effective for finding gems, oil, or coal. In theory, a small dip needle like above (about 3-½ inches across) is not likely to be sensitive enough to find nuggets or coins, but people claim to have success in finding largish metallic deposits with them. 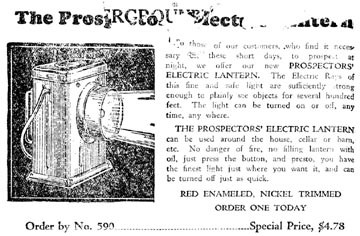 At first glance, the interest in prospecting in 1930 seemed to me to be Depression-related, but by the 1920s prospecting as an individual sport was declining, having far more popularity fifty years earlier. The gold rushes of the 19th century were fading, but still recent enough to encourage people to believe that another mother lode was just waiting to be found. The Model Publishing Company of Chicago, Illinois no longer exists — and that’s about the only thing I can truly say for certain about it. The address, 443 So. Dearborn, is at the north end of Chicago’s famous Printer’s Row, a neighborhood of publishers of all shapes and sizes. Several publishers have claimed the address 443 So Dearborn from the late 19th century until the 1940s, but later show up again with a different Dearborn street address, which leads me to believe 443 saw several publishers come and go over the years, and small publishers didn’t leave their stakes down too long in any one office. Somebody else does have a copy of this catalog for sale, and they list it under ‘geology’ as a category, and dates it at 1934. My copy advertises an almanac for 1931, so I’d say mine is a few years older, from 1930. The books that Model Publishing put out (what few I could actually find) all were published in the late 1920s or early 1930s, which would indicate that Model wasn’t around for more than 10 years. Categorizing the catalog as “geology” is a good guess just from looking at the cover. A rock pick, a compass, a book titled “minerals” would all make it seem that Model’s catalog is for the serious prospector, a mining man looking for oil or valuable minerals. 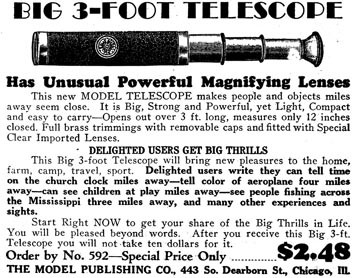 It’s not quite the case; Model’s catalog has a bit of what we’d call today as “occult” items, and in my mind I associate it with the Johnson Smith Co. “Things You Never Knew Existed” catalog. Because I’m trying to make Infomercantile more directly research-based, rather than “cool thing I found today,” I’ll be deconstructing the Model Publishing Catalog over the next several days. You are currently browsing the The Infomercantile blog archives for May, 2008.